21.04.2013 The 9th Georgian Aikido Championships and Festival. On 20th April in Tbilisi Judo Academy was held the 9th Georgian Aikido Championships and Festival. 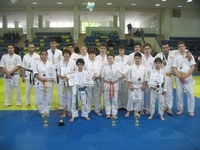 There were participants from Georgian Competitive Aikido Association's clubs. In Aikido festival also were participants from Yoshinkan Aikido Federation, Aikikai Aikido, Aiki Jitsu Goshinkan Federation and participants from Azerbaijan Aikido Federation. Championship’s best sportsman’s title between children was awarded to Nikoloz Bekoshvili, between Adults to Vakhtang Obgaidze. Both from Dighomi club. 4. Central Club - 0 Gold, 2 Silver, 2 Bronze, total 4.